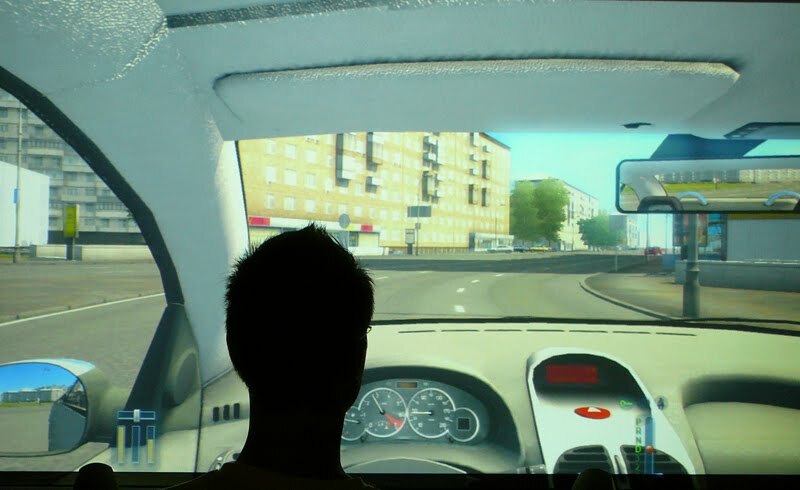 Based on our experience developing the driving simulator for this experiment, my colleagues Jaka Sodnik and Grega Jakus and I propose a low-cost, laboratory based testing framework for in-vehicle interfaces. 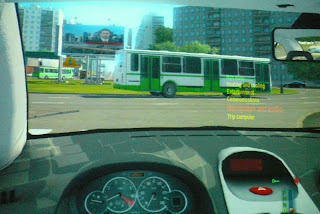 Exemplified by a comparison between an auditory interface, a Head-up display (HUD), and a combination of both we show how task completion times, driving penalty points, mental workload, and subjective user evaluations of the interfaces can be collected through different logging systems and user questionnaires. The driving simulator used in the experiment enables the simulation of varying traffic conditions as well as different driving scenarios including a highway and a busy city center. The framework will be presented at the 5th International Conference on Advances in Computer-Human Interactions (ACHI 2012). 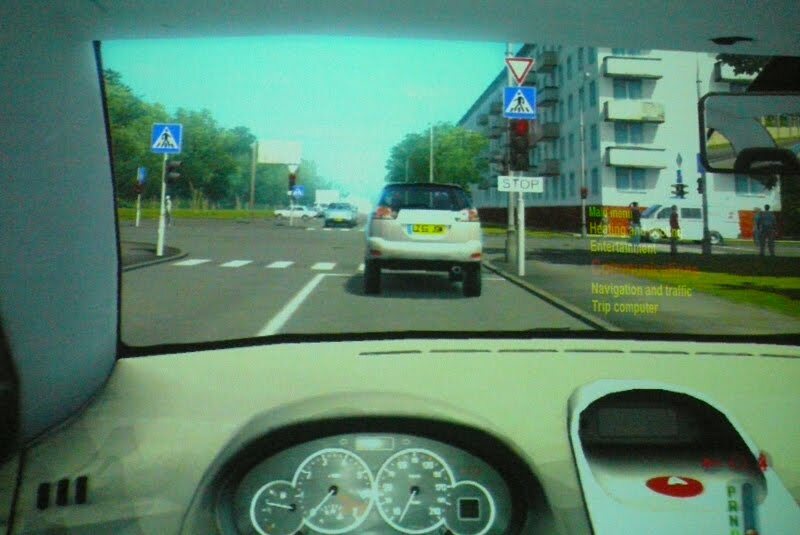 This is the Head up display (HUD) that we are using in our study. We compare it to an audio only version of the same menu and a combination of both. We are half way through the study and so far our results suggest an overall preference for the audio-visual menu. Although, there are some who clearly prefer the visual only and some who clearly prefer the audio only version. 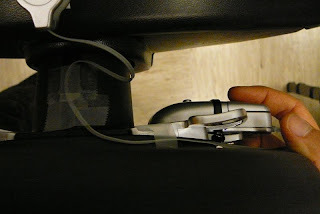 To interact with the menu we use a customized device (in fact a small computer mouse) that is attached to the steering wheel. 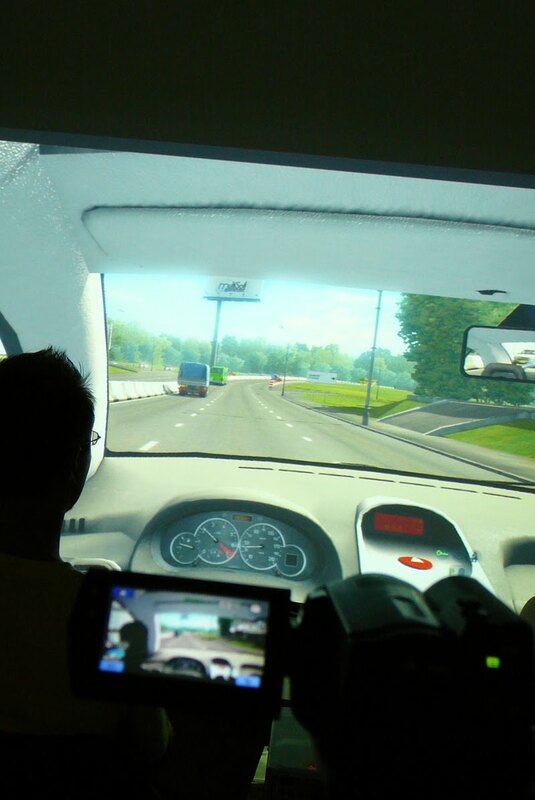 It is placed behind the wheel as we want to reduce the haptic distraction as much as we can. The scrolling wheel of the mouse lets the user select items within the menu. By pressing the lower button of the two-button mouse the user can select items (or decent in the menu hierarchy) and by pressing the upper button the user can go up in the menu hierarchy. Update: I've added a User ID and Timestamp to Keith's original version. 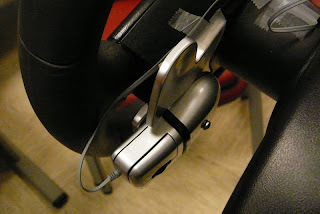 Comes in handy if you do user testing. You can find it here. 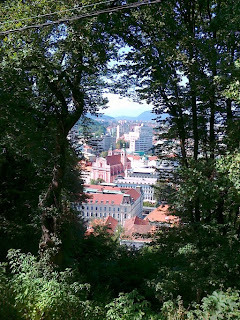 Ljubljana is a beautiful town. This picture shows a view from the castle, which towers over the old city centre. The look and feel is a bit like Prague but with less tourists. Not that I have anything against tourists being one myself. The weather is perfect with a steady 30-35 C. Luckily the lab's air conditioned. We almost finished writing the experimental plan and if everything goes according to plan we'll start running experiments next week. I can't wait to see the first results - I'll keep you posted! Finally, after 4 years of research I submitted my thesis: A Holistic Design Concept for Eyes-Free Mobile Interfaces. You can download it here (12.5 MB). My colleague Jaka Sodnik from the University of Ljubljana, Slovenia, invited me over to do a follow-up study on in-vehicle interfaces. We worked on this before and now we both have the time to take another, closer look at how driver performance can be improved. 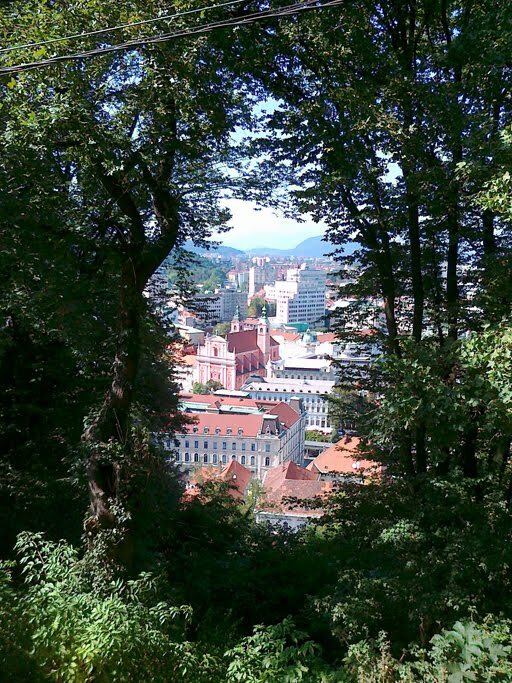 I will be leaving for Slovenia on the 14th of August and am very much looking forward to visit the beautiful city of Ljubljana. How to gain an overview using sound? While at the Aalto University working with Kai Puolamaki and his team we looked at how a user can obtain an overview of items in an augmented reality scene. We focused on using sound only and derived some guidelines that may help designers to chose the best types of sounds, reproduction method, and onset intervals. This is a demo of the experimental design and the sounds we used: This work has been published in ACM Transactions on Applied Perception (2013).